If you&apos;re looking for a place where you can enjoy the outdoors while you exercise, the bike trails are the perfect place for you. 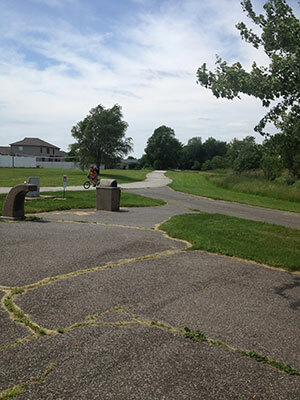 Biking through the trails helps evoke a relaxing and enjoyable sensation through exercising. In honor of Father&apos;s Day, my dad and I decided to bike down the trails from Hobart to Chesterton. We started on the Oak Savannah Trail, which runs through Hobart, and continued onto the Prairie Duneland Trail until its end in Chesterton. Both my dad and I, being highly competitive, would stop racing each other to check out cool side attractions and the beautifully diverse scenery. As we traveled down the trail, we passed a wide variety of blooming wildflowers and native birds flying around. The trail itself was quite an adventure, too. My dad and I pushed ourselves to the top of hills and flew back down the other side. We took breaks over the bridges and looked out over towns and waterways. If you&apos;re looking to explore, there are many side trails that lead to little attractions and parks. We traversed one path that led us to a little dairy farm and fishing spot. After spotting a break in the woods toward the end of the Chesterton trail, we rested in a park made almost entirely of tires! The people on the trail ranged from runners, families on bikes, professional bike riders and walkers just enjoying the nature. Following Midwestern tradition, the fellow trail-goers were all kind and polite. They would say hello, wave as we passed or even give us the prestigious bike nod. Everyone seemed happy to be out enjoying the weather. This is easily done with the trails&apos; impeccable balance between sunny open space and shady trees. The trails aren&apos;t just for us humans, either. They are very animal-friendly as well. I take my dog for daily walks along the bike path. It&apos;s a great place to interact with other dogs and have them sniff around. Just remember to pick up after your pets. If you forget, some parts of the trail have gentle reminders written in chalk. There was a bit of a rough patch while biking through Hobart. They&apos;re still trying to finish connecting all the trails, though it looks just about complete. When the trail is finished, it will be a perfectly smooth, nature-filled path. Until then, my advice is to just cut through Hobart&apos;s uptown area and ride along the charming lakefront. 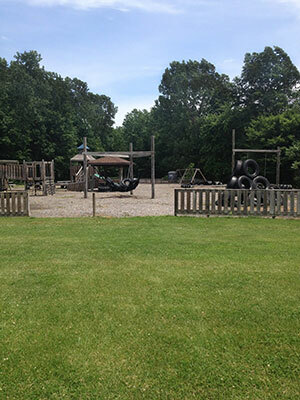 You can ride over the dam, lounge at Festival Park or even have the little ones play at a park by Lake George. My dad and I both enjoyed the bike ride so much we&apos;ve decided to make it a common event. Not only will it get us in shape, but the trails will help us explore more of the area. We might even hit all 125 miles of trails that the South Shore area contains! For more information, maps of the trails and places to visit in the region, stop by the Indiana Welcome Center, located right off the Twin Rivers Trail, or visit more of our website! Former communications intern with the South Shore CVA.